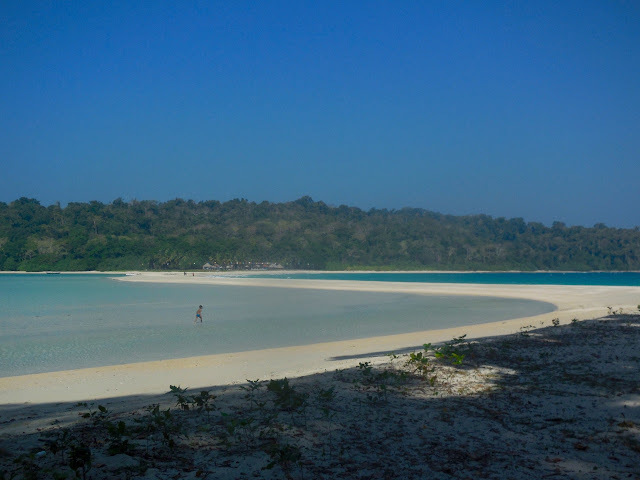 Andaman & Nicobar - Middle & North Andaman - Ghumakkar - Inspiring travel experiences. Andaman & Nicobar islands are inhabited by various tribes which flourished untouched by rest of the world till British reached there and setup major initial settlement in 1858. A number of tribes have been decimated by diseases or killed by British and outsiders. A few are are left like – Great Andamanese, Onge, Jarawa, Nicobarese, Shompen and Sentinelese. Out of these Jarawa are most well know. They are known due to their presence across Andaman islands and eventful history of their contacts, sometimes conflicting with the occupants of Andaman. Some of the tribes like Nicobarese have embraced the modern lifestyle whereas Sentinelese are completely isolated due to them being restricted to an island. Jarawas till 1997 were hostile to outsiders and would attack them but an incident where outsiders saved one of their boy, healed him and sent him back gained enormous trust among Jarawas and they started coming out to villages and roads and are assimilating with outside world. But government itself seem to be clueless how to handle such a delicate situation. Interested people can read about the Jarawas on the internet or read the book called “The Land of Naked People“. 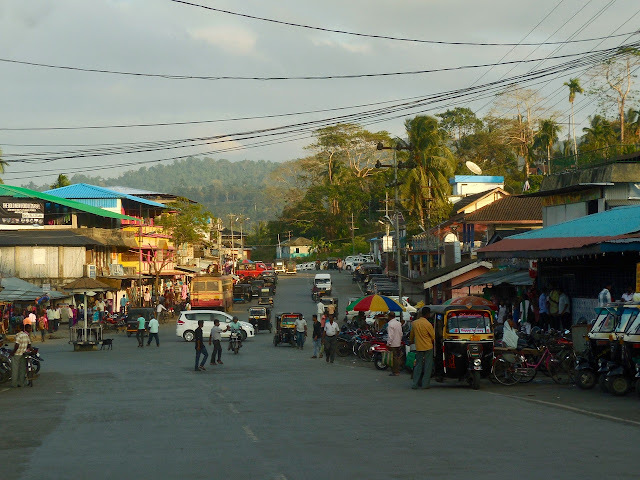 Andaman Trunk road was built in the 70s from Port Blair all the way to Diglipur some 250km away, single lane road criss-crossing the forests of South, Middle and North Andaman well within the territory of Jarawas. Since Jarawas started coming to main stream, their exploitation also started. In early 2010s, there were controversies surrounding local tour operators conducting human safaris i.e. taking tourists to see Jarawa people and coercing them to perform like dance. More about it here. Once this scandal broke out tighter measures have been put up to protect Jarawas. These people are aboriginals living in these islands for past 50,000 years. They have evolved in completely different environment than rest of the humans so do not have immunity to any diseases which might be passed on to them. Their number is anyway small somewhere around 500 so its extremely delicate situation. Government has raised a Jarawa Protection Force to safeguard their interests like nobody should enter their reserve forest. 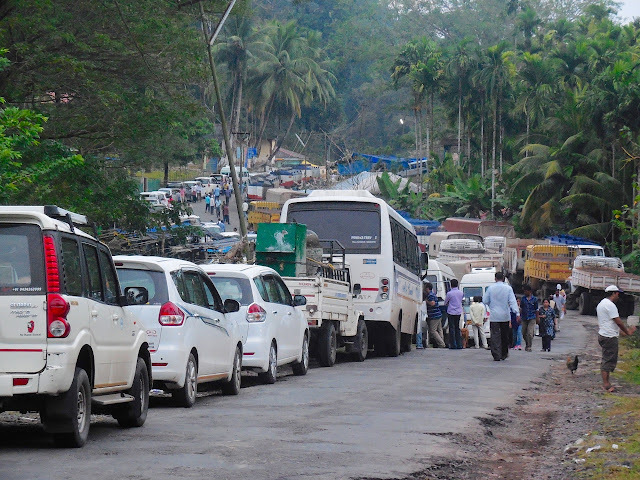 The traffic on Andaman Trunk Road is regulated. There are only 4 times in a day that convoys of vehicles are allowed to pass through the Jarawa territory, a 45 km stretch between Jirkatang and Middle strait. Vehicles are not supposed to stop in between, nobody should take photograph or throw anything. There is another stretch in Middle Andaman with Jarawa Protection Force check post but it didn’t have timing restriction. The South, Middle and North are separate by narrow straits just few meters apart which make them islands. There is no bridge over them as of now and need to be crossed by ferry boats. Vehicles wait in a queue to get onto these ferry boats to be taken to other sides. Buses and govt vehicles have priority. There are just two such boats ply at a time, so it could be a long wait for one’s turn. Due to the convoy rule and queue to get onto ferry the entire 250km journey takes anywhere from 10 or more hours to complete. Some prefer to start early to be early in the convoy & get onto the boat but wait at the check post. Some start late, don’t wait much at check post but are late to cross the strait. Either way it takes time. We started early at 4:00AM to be at Jirkatang to be able to cross with 6:00AM convoy. During convoys, Jirkatang comes alive to serve the waiting passengers. I had a hot Wada Sambar breakfast in the early morning waiting for the convoy. There are bathrooms available for passengers to freshen up while they wait. By the time convoy started, there was light. The 45-km through the Jarawa territory take an hours and half of non-stop drive. The forest all through is dense and pristine. Our driver pointed to some huts perched on a hilly slope and after some time we even saw a group of Jarawa men sitting beside the road but it was in a flash. 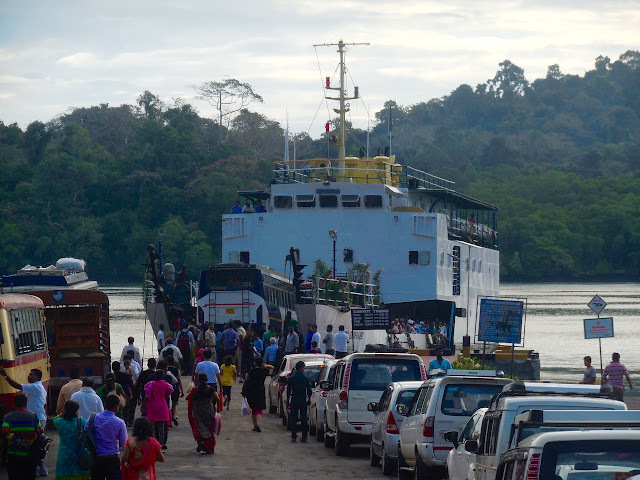 At Middle strait we witnessed the ritual of getting vehicles onto and out of ferry. It requires skill to get in and out the ferry and one has to be careful. There were two ferries plying, one big and one small. This limited the number of vehicles which could be taken. The ferry crossing is ticketed which our guide took care of. We climbed the upper deck which has seating and it took 15-20 minutes to cross the strait to Middle Andaman at Baratang. While on the ferry talked to an official looking person who informed that the plan for building bridges over the two straits has been sanctioned and in few years there will be bridges. I have a mixed feeling about the bridge. Even though it will be easier to travel but will invite more traffic and could play havoc with the place. Most of the tourists come upto this point to visit nearby limestone caves. Very few venture beyond this point but we were going to. We had a light breakfast at Baratang and then started towards Diglipur. 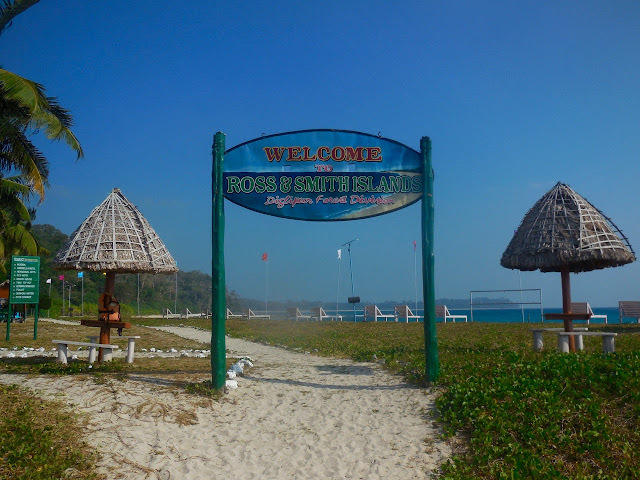 We crossed another strait to come to North Andaman. There are couple of towns in between called Kadamtala & Rangat and several small settlements. After Rangat, the roads goes to eastern flank of island and runs for some time hugging the coast. There are number of interesting spots in between which we would cover while coming back. Due to lack of traffic, there are hardly any eatery or dhaba for the travellers. Throughout the journey there were small settlements could be seen in distance. Typically settlement consist of few thatched houses with some fields around, some cattle and plantations like Coconut or Arecanut. Since our driver keeps coming here so he stopped at a south indian home eatery known to him. From there we hit a T-point known as Lucknow point, right going to Mayabunder and left going to Diglipur. At around 5:00PM we reached Diglipur. Once in Diglipur you could be mistaken that you are in some small town in Bengal. North Andaman has lot of Bengali population which has historically settled in these parts starting as prisoners brought by British or settlement after Bangladesh war. Here Netaji Subhash Chandra Bose’s pictures are prominent. Incidentally, he had visited Andamans in 1945 to negotiate with Japanese. So, lot of influences for current demography. We were going even further to Kalipur to stay at Turtle resort there. 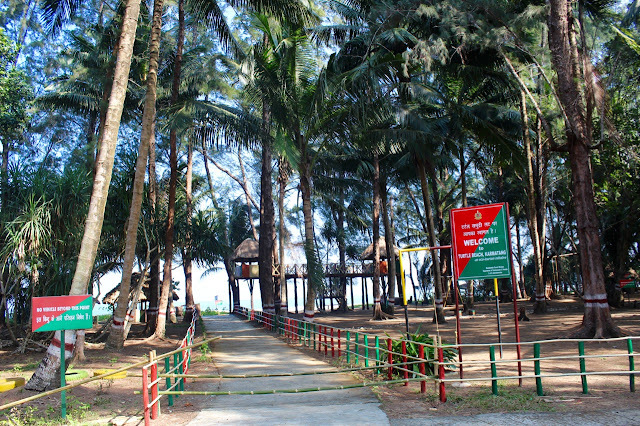 Turtle resort is close to Kalipur beach which is known for turtle nesting site. The hotel itself is beautifully perched on a small hill, airy, clean and with decent rooms. After check-in we immediately went to Kalipur beach. Water had receded quite a bit. The sand was grey with ripple-like striations. 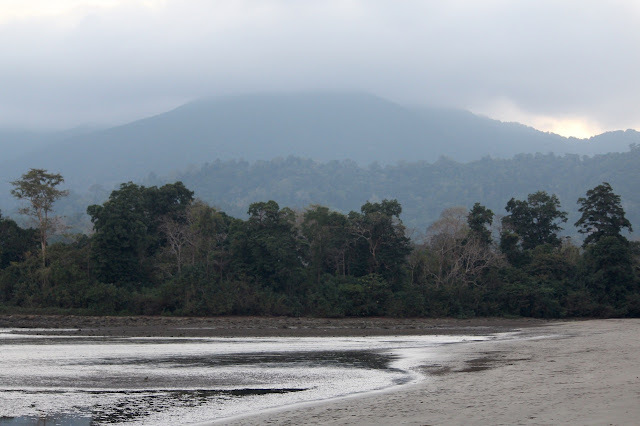 We could see Saddle peak which is the highest peak in Andamans. One can trek to peak’s summit but takes full day for which we didn’t have time. Soon it was dark and we were back in hotel. This is the season in which turtle’s come and lay eggs on various beaches including Kalipur. There are some staff of Forest department, who keep an eye on turtles laying eggs and once they are gone, they pick up those eggs and put them safe in hatching incubators. The reason they do it is so that stray dogs don’t dig them up. It is a rare sight to witness turtle laying eggs which mostly happens in the night. I thought I will go and witness but it needs some patience waiting for them in the night. I befriended an Bengali gent in the hotel who was interested in witnessing the event. We decided to go to the beach at 12:30 AM. When we reached there, the staff of Forest department was present. There were other enthusiasts including foreigners waiting in the makeshift hut for turtles. It was an eerie feeling to stand there on the beach with sounds of waves but night was moonlit and there was company so it was ok. We chatted for an hour or so but then sleep and urge to lie down got better and we returned back after an hour. In the morning we came to know that there was no turtle that night. Today we were destined to go to Ross & Smith island and then drive to Baratang to stay overnight and visit Parrot island in the evening. We started early from hotel and were at Aerial bay jetty from where the boats ply to Ross & Smith island. The islands are twins connected by a sand bar. When the water level is low, the sand-bar is visible and one can walk across. When its high-tide, the islands appear as two distinct island. These are restricted islands and one has to take permission of Forest department to visit them. The boat also requires a permit from the port of Aerial Bay. The boats were anchored but water had not risen enough for them to be brought to the steps from where we could board it. So, we had to wait for 30 minutes for it. Once we boarded, it was a speedy 20 minute ride to the islands. The water was low so sand bar was wide and high. The boat anchored on the calmer side of sand bar. The water was clear and I guess the pictures that we have seen of boat floating on water with its reflection at the bottom could very well have been from this place. We had couple of hours here so without wasting much time we started exploring. We had brought snorkelling sets so we tried a little bit of snorkelling in the shallow water. Apart from us there were hardly anyone else as it was quite early in the day. It was like having our own private infinite pool. We did manage so see some small fish. The place was unbelievably developed for its remoteness. There marked paths in sand, brown huts, white recliner wooden benches and changing rooms. The fluttering flags in high wind gave the place an upmarket look. You don’t find such setting even in easy to reach beaches. One must admit that throughout our journey that even in such remote island, Andaman & Nicobar tourism department has really developed the locations which one doesn’t find even in mainland. The Ross island is protected and one needs a permit to visit it and there is a person handing out permit at the Smith island. Height of vigilance! I took the permit and walked to Ross island. It is possible to go inside the forest but didn’t have the time and guts to do it. After experiencing the place to the fullest finally we had to bid goodbye to the islands. Again felt that we never have enough time to enjoy such delightful encounters. 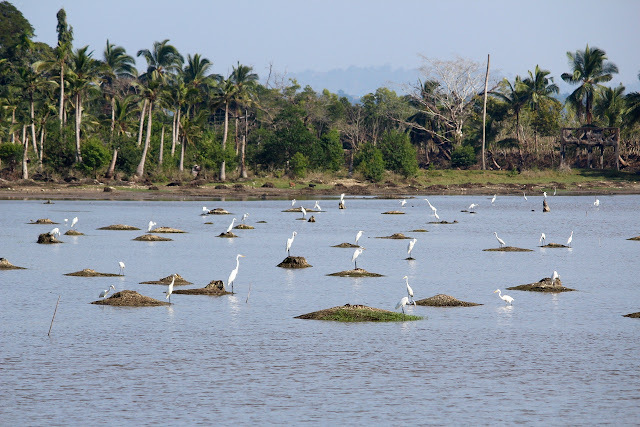 Once we came back to Aerial jetty, our driver informed that going to Parrot island is not possible as visit to it is suspended, so we can visit Karmatang beach at Mayabunder. We bade goodbye to Diglipur and from the Lucknow T-point went left towards Mayabunder. We didn’t have to go inside the town as Karmatang beach is a little away from it. We were the only ones who were there and it was decently developed with huts, benches, play area and the actual beach being beautiful. 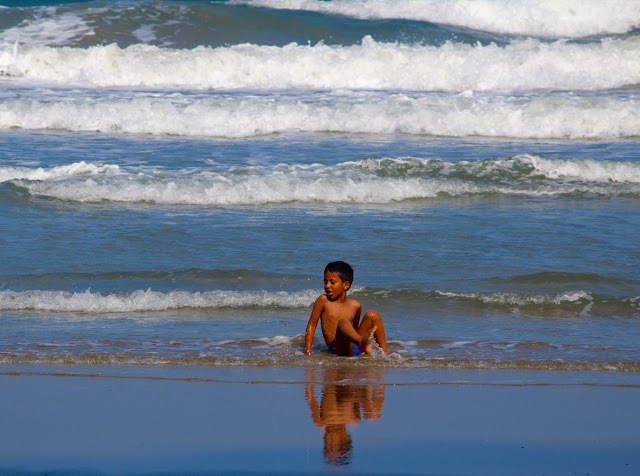 Throughout the trip our son was always eager to get into the water and and reluctant to come out. We left in an hour cause we had to reach Baratang by evening and for that we had to cross the strait between North and Middle Andaman from Uttara jetty and ferries stop at dark. We stopped for a quick lunch at the same south indian house eatery. The stretch has a number of locations developed by A&N tourism. 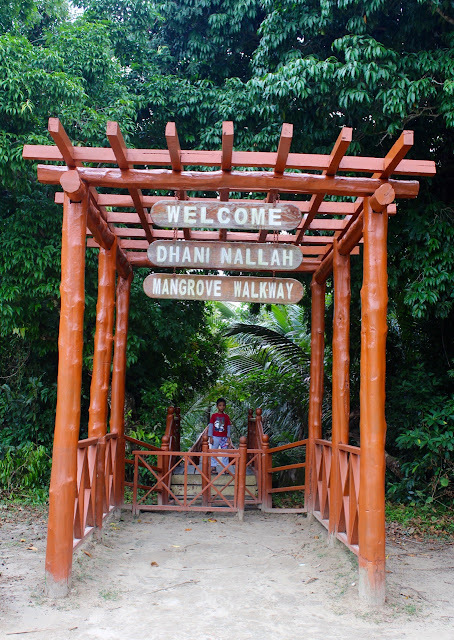 First one is Dhani Nallah mangrove walkway which is half a kilometer walk over wooden promenade into mangroves. 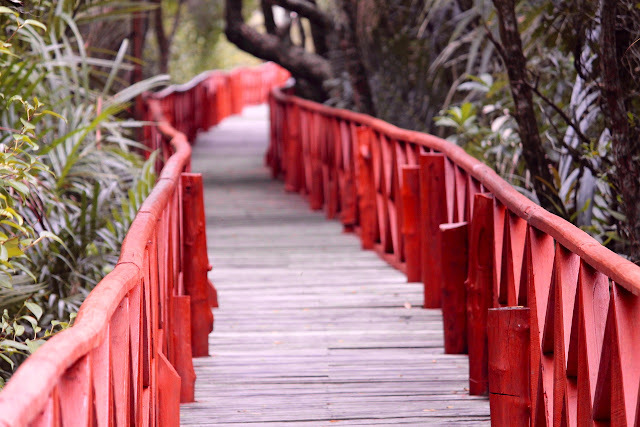 The wooden walkway is excellent. The quality of walkway is great probably not very old with seating huts every few minutes. The mangroves were marked with their names and there were large information boards with detailed information. Turned out that sea shore has a turtle nesting site as well with detailed information about turtles. We walked all the way and to the sea shore and back. Next stop was Aam Kunj (Mango grove) which has a beach and a little developed with huts, benches, play area and generally spruced up place. There is a huge Sea-Mahowa tree here. We briefly stopped at Maurice Dera which is a scenic point of two small rocks with a path made around them. By this time we were a jittery as driver informed that probably there won’t be any ferry after 5PM well before sunset. We were a little angry at driver why he didn’t take into account this? I was contemplating what if we don’t get a ferry? We will have to come back to Rangat which around 45km from the Uttara jetty. I was even contemplating knocking on someone’s door if required for a night stay. We still held our breath while driver was frantically driving to reach the jetty hoping there would be ferry. Sun had set and it was dark while we were still to reach jetty. But had a huge sigh of relief when we reached there and found ferry has just docked and vehicles were loading and there was place for us! After crossing over there was still 30-minutes of drive to Baratang. We were going to stay at Rest House of forest department. The cook there cooked up a delicious dinner for us. Next day we again woke up early to visit Mud volcanoes & limestone caves. 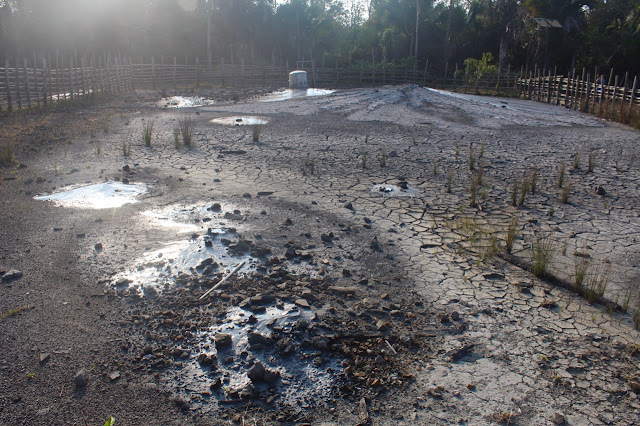 Mud volcanoes are tiny conical volcanoes which spits out a steamy, muddy slush every few minutes and there is a group of them. They are around 30 minutes away from Baratang. Andamans are a geological active island and has India’s only active volcano at Barren islands but these were like nano version of that. Still it was worth a visit driving into interiors of Andaman and visiting such exotic place. Back at Baratang jetty, our driver was busy arranging the tickets for the lime stone cave. It was pretty crowded at the jetty as boatload (quite literally) of tourists from Port Blair had arrived. The permission has to be taken for the whole boat’s occupants not just a group and there are officials checking up on safety like life jackets and license of boat. Thankfully, we were in the boat soon and off to lime stone caves. 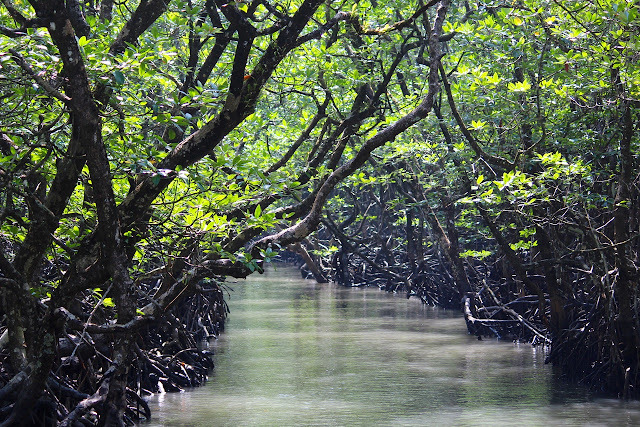 It is a 20-minute speed ride in the strait and then cutting inside mangroves in a canal completely covered by mangroves. From the alighting point its a 15 minutes walk to the caves. The caves were overcrowded with tourists and their guides busy showing different shapes on the walls. There was a Ganesha and a Conch figure and few other shapes. At one location, the surface was sparkling due to mica getting mixed with the calcium deposits. 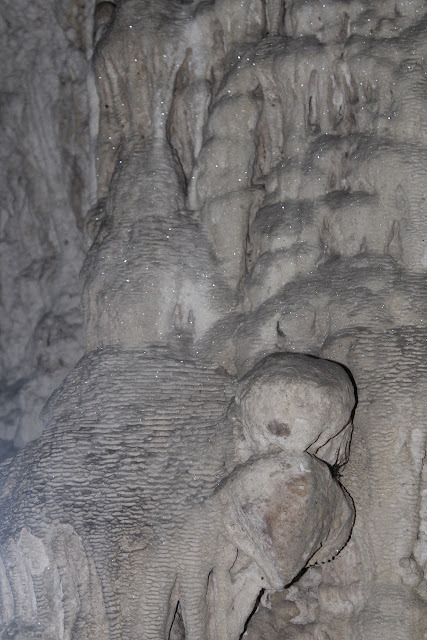 Then there was a pair of stalactite and stalagmite growing very close but I believe will never meet due to constant touch of people to feel the phenomena! The caves were impressive and I would have enjoyed it had there been much less crowd. Outside there was a distinctive house made of wood & straw with cattle and a little pond. We came back to Baratang jetty ready to cross over and be in the 12:30PM convoy towards Port Blair. The journey back was turned out to be a chore but this time witnessed that portion of road between Port Blair and Jirkatang. At one point saw a Tsunami devastated coconut grove now turned into a pool of water with a white crane sitting on remaining stalks. Back in Port Blair we were still not done. 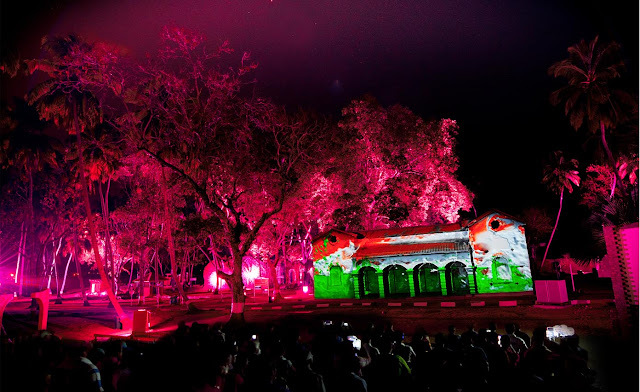 We had to witness the Light & Sound show at Ross island for which we again went to Junglighat jetty. For this show, the ferry to & for journey and show is included as a single package. We left the jetty at 4PM and after an hour we were at Ross island. This journey was repeat of our North bay tour. However, this time it was in evening and there were some good moments fitting for last day of the trip. 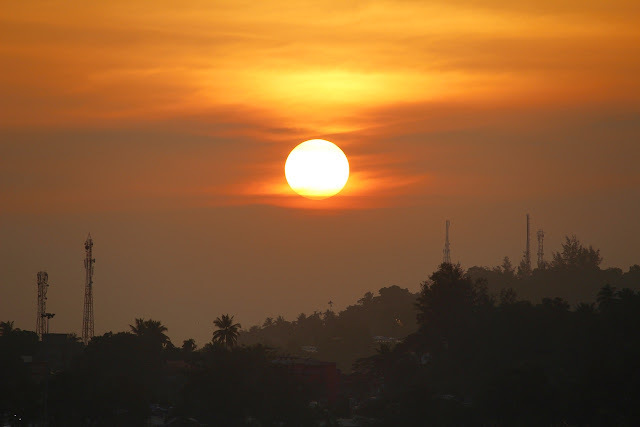 First we witnessed crashing waves into the Ross island walls and then there was beautiful sunset over Port Blair town symbolising end of our trip. The Light & Sound show was one of the unique experience. The old building of bakery became the screen with trees around being extension of the screen. The show chronicles entire history of Andamans from initial settlement to Independence but the way it does is the high point. The quality of visuals, commentary, sound and setting could not be any better. In the credits we came to know that it had Gulzar, Resul Pookutty, Revathy in the team which developed it. We came back to Port Blair and packed for next day’s return journey. Today we had flight at 8:00AM which was on time. At Chennai we again opted for Retiring room and caught evening flight back to Pune. If I happen to go back, I would like to do these things. 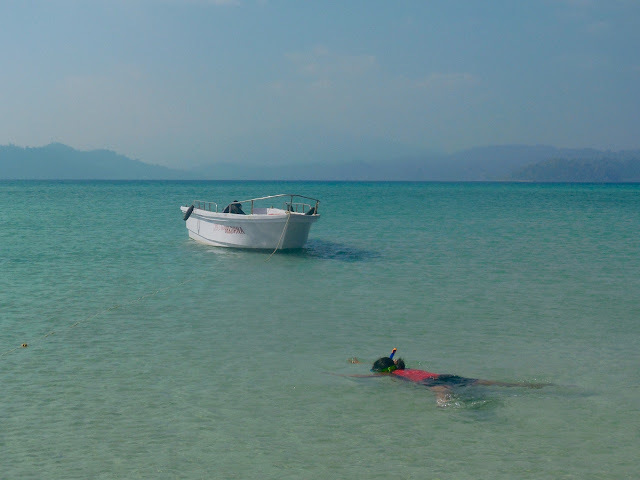 First would be to do Scuba diving, then trek to Mount Harriet, trek to Saddle peak, Long Island, Barren island, Cinque island and visit Hut bay in Little Andaman which is accessible to tourists but a little distant. Another interesting thing to share. After coming back from Andaman, I was visiting Gyan Adab center in Pune and found an exhibition going on about paintings, photograph and artifacts from Andaman. There came across a book called “Last Wave” by Pankaj Sekhsaria was there. Coincidently, the author was present there and had a good exchange with him. Now when I read the book in hindsight, I could relate to number of things which I saw and heard during the trip. Wow. After reading this, it seems that there are endless places to visit and so much to do. And while reading, I thought that one can actually take his car in a vessel from Chennai to A&N. Just keep all your stuff and keep moving. 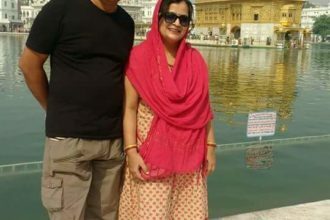 आप को बता दू की अगर बॉर्डर देखने का मन हो तो सुबह या 12/1 बजे तक भीड़ बढ़ने से पहले हो आये ताकि इत्मीनान से देख सके और हो सकता है पाकिस्तानी रेंजर आपको चाय पानी पूछ ले…साधारण दिनों में बॉर्डर पे आपसी भाईचारा और मित्रता का माहौल रहता है दोनों और के सैनिको के मध्य..बातचीत हंसी मजाक..चलता रहता है.